Paul’s lectures have inspired and motivated thousands of photographers and artists throughout the US. He has also been called to South and Central America to present his lectures and 25 plus years of experience. Paul’s lectures cover the range from the observation of light, shapes, forms and textures,er as well as, the 12 elements of better image making that helps create an image with greater impact. His most popular series of lectures of recent have been The Art of Storytelling. 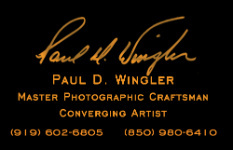 It has been said that Paul Wingler is one of the best storytellers through his photographic imagery. His use of humor, at times, has helped him to drive his points home in his seminars and lectures. Paul will share many of his award winning images and discuss them as to how he came to create his images. His work has been selected to represent Team USA in the World Photographic Cup in the category of Reportage. Paul is available to travel and speak to your photography group, organization or photographic/art department at any university or technical school.